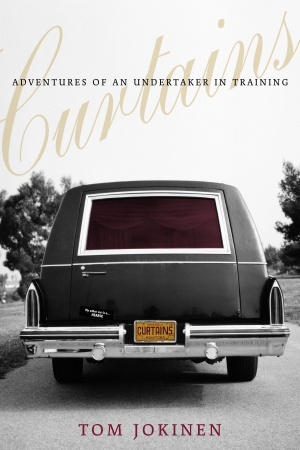 In Curtains , journalist Tom Jokinen recounts his months as an undertaker-in-training at Neil Bardal’s funeral home in Winnipeg. Under Bardal and his staff, Jokinen shared both sides of the undertaker’s trade–the hands-on skills such as how to dress the sometimes uncooperative dead, and the so-called soft skills, such as how to help the living cope with loss. Ironically, as more family-owned funeral homes are bought up by international corporations, and more people choose cremation over caskets, embalming, and burial, (the fully-figured–“full-fig” funeral), Jokinen discovers a death industry, that itself is dying–that must resort to selling catering, multi-media memorials, and caricaturish memento mori to make profit from death. But it wasn’t until twenty-five years ago that Neil (Bardal) finally embraced cremation and became what the mainstream industry calls a “bake-and-shaker,” a lower-cost provider of a cleaner, more manageable, less Gothic and scatterable end product.